In 1 1/2-quart saucepan, place eggs; add enough water to cover by 1 inch. Heat to boiling. Immediately remove from heat; cover and let stand 15 minutes. Drain; rinse with cold water. Place eggs in bowl of ice water; let stand 10 minutes. Drain. Peel eggs; coarsely chop. Meanwhile, in 3-quart saucepan, heat 4 cups water to boiling. Reduce heat to medium. Add potatoes; cook 5 to 8 minutes or until tender. Drain; rinse with cold water to cool. Drain well. 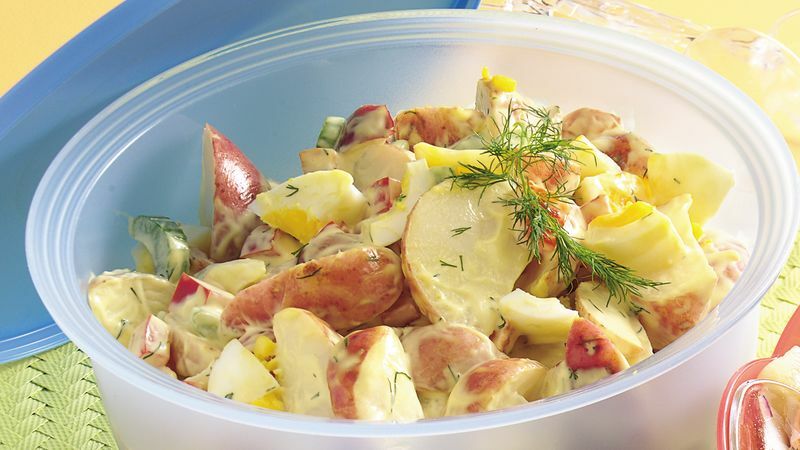 In large bowl, mix cooled cooked potatoes, the celery, bell pepper and chopped hard-cooked eggs. In small bowl, mix all dressing ingredients until well blended. Add dressing to salad; toss gently to coat. Cover; refrigerate at least 1 hour before serving. Look for the refrigerated potato wedges or the diced potatoes in the grocery store refrigerated section near the dairy products. The potatoes are partially cooked so they are convenient and quick to use in recipes.